Tony Horton’s Latest P90 Workout for Everyone! 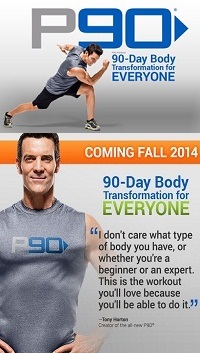 If you are a Tony Horton fan then you must have heard about the Power 90 Extreme (P90X) series. This fall, Tony is coming up with a 90 day transformation for everyone with P90 – no number, no x’s or anything! This is a simple plan for everyone, regardless of age or fitness level! The workout will be a complete body transformation for everyone that can be done in just 25-45 minutes a day for just ninety days. Unlike the other P90X series, which are extreme workout regimes, P90 is a simpler fitness plan. The workout routines will include simple cardio and resistance training that will get you the body you have always wanted. This new workout by Tony Horton, P90, is definitely not for pro fitness level individuals and those who want to bulk up, as here Tony aims to get those people moving who have not done anything in a long time or ever at all. The P90 workout release date is yet to be announced in the fall of 2014. Stay connected to get the first hand updates of Tony Horton’s latest workout program.